Parathyroid symptoms&#8230;your brain on too much calcium! Parathyroid symptoms can vary, but almost everybody will have them. Fatigue is by far the most common of all symptoms. Let's look at Crabby Abby! Crabby Abby will forever live in my mind, because she described parathyroid symptoms and the effects of high calcium on your brain better than any patient ever. If somebody says "people with hyperparathyroidism don't have many symptoms," don't tell that to Crabby Abby-she may bite your head off! This 83-year-old grandma-with-an-edge from Vermont looked me in the eye and said, "This thing has turned me into a tired, depressed, forgetful, crabby, insomniac!" I responded that she must remember the old commercial of the skillet and the egg from the 1980s: THIS…is your brain on drugs! 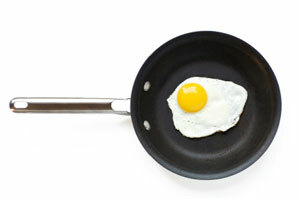 Parathyroid symptoms are like this famous skillet and fried egg: "your brain on drugs." For the last several years Abby has unknowingly been developing parathyroid symptoms. She noticed that she needed to take naps more often than in years past. She seemed to be slipping into depression and couldn't remember simple things like relatives' phone numbers which she had dialed on a daily basis as far back as she could recall. Her fuse seemed to be shortening, and her family thought she was developing Alzheimer's disease. When she saw her primary care doctor, he noted that Abby's calcium level had been between 10.4 and 10.9 for about six years. A PTH level had never been checked, as her doctor commented that she could expect these symptoms as she got older. "After all, you are 83 years old; you can expect to be tired, forgetful, depressed…and a little bit cranky!" he offered. The most disturbing thing for Abby was that she knew she was not the bubbly, funny, energetic, compassionate "fox" that her dear husband, Homer, had married 55 years ago. Her grandson, Jake, who lives in Pennsylvania, had seen a similar situation in his mother-in-law, who had had a parathyroid operation with us a few years ago. Jake suggested that his grandmother have her calcium checked "Those sound just like parathyroid symptoms. I bet you have high calcium". Abby said, "My calcium IS high, but my doctor's not very worried about it." We've all heard that one before…and thus the self-referral ball got rolling. Yes, many patients self-refer for parathyroid surgery because these symptoms are commonly dismissed. When we first met, I barely had the chance to introduce myself when Abby launched into her one sentence synopsis of what parathyroid symptoms do to you. After she snarled her classic line, I asked Homer (who was dutifully sitting at her side) if this description was accurate. Homer dismissively lifted his palm, saying "I plead the fifth!" I told Abby, "It's not your fault. You have high blood calcium. You have a parathyroid tumor. You didn't put it there; neither did I. But I'm taking it out today!" I explained that they are in the right age bracket that they will remember the famous anti-drug ad campaign from the 1980s. You remember this one: the skillet and the egg. The ominous voice says, "This is your brain…" The egg is thrown into the skillet, and it sizzles. The voice flatlines: "THIS…is your brain on drugs." Well, I explained to Abby that what she's experiencing is her brain on too much calcium. It slows the nerve conduction process. Calcium is what our nerve cells use to conduct electricity, and therefore normal calcium is necessary for our brains to function properly. Calcium serves as the electron that passes through the wiring of our brains and nerves. With too much calcium, the delicate balance is upset, and things slow down. Our mood is depressed. Synapses (connections between nerves) don't fire like they used to. The high blood calcium causes energy to fall, memory and concentration to fade. Sleep is disturbed: some patients can't get to sleep or stay asleep-while others sleep all of the time and don't feel rested when they wake up. This is all very frustrating, hence the crabbiness! This big parathyroid adenoma is causing her symptoms&#8230;making Abby crabby! Most doctors understand the well-known parathyroid symptoms like kidney stones and osteoporosis. These have been described since the 1920s (ie., bones, stones, groans). However, most patients with parathyroid disease don't complain of a kidney stone or osteoporosis. Most patients with parathyroid disease complain of these irritating symptoms. It is the frustration of feeling your mind slip away that causes patients to grow cranky and short-tempered at the inability to accomplish simple tasks-to recall simple facts. These are the symptoms patients report as robbing them of the joy of life. If a patient complains of parathyroid symptoms, it's fine to diagnose her with chronic fatigue syndrome, depression, stress, etc., but not when they have a high calcium level! Again, I reassured her, "It's not your fault. It's a tumor, but if this tumor wants to do anything else to you, it only has a couple more hours to do it!" 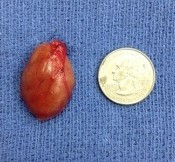 Off to surgery she went, and out came a parathyroid tumor-a pretty big one to boot (see photo). Simple as that. Her calcium and parathyroid hormone levels returned to normal in the postoperative period, and she reports that her parathyroid symptoms are getting better and better. As Abby says, "Lemme get to the good stuff, Doc. I feel like Homer's ‘babe' again." Now you see why she's so unforgettable. Recent study shows: Depression, anxiety, and decreased Quality of Life appear are related to hyperparathyroidism. Successful parathyroidectomy reduces psycho-pathologic symptoms and improve Quality of Life in this setting. JAMA Surg. 2013 Feb;148(2):109-15. Parathyroidectomy, elevated depression scores, and suicidal ideation in patients with primary hyperparathyroidism: results of a prospective multicenter study.